WordPress themes with Parallax scrolling mesmerize readers. Because Parallax pages hold attention with their multidimensional scrolling operation, readers want to view your entire page, and will absorb all of your content. A Parallax theme is another very valuable tool in the WordPress arsenal. 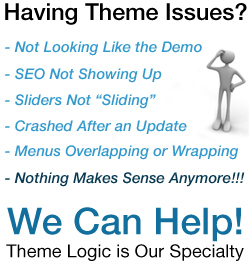 These themes are so incredibly fun, readers will want to scroll to the very bottom of your pages to see what’s next. Properly designed, a Parallax theme will increase conversions, page views and time spent on your site. Not bad for a video game effect from the 80’s! Parallax’s unique perspective capture’s the interest of visitors and helps them explore your site. As they move through your site, the dynamic, layered feel holds their interest until they’ve seen it all. Parallax Themes give you an edge with gripping visual effects and SEO benefits. But, Parallax themes can be difficult to install and manage. Check them out, preview the live demos, and see what you think. If you like the Parallax effect, call us. We can install one for free.